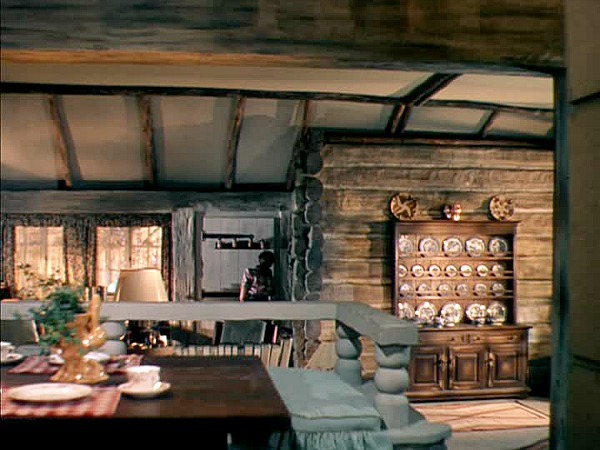 I’ve heard from so many of you that you love the houses from this film that today I thought we’d take a closer look at all the sumptuous sets that were featured in it, from the train car where Ellen and Richard first meet to the Back of the Moon Lodge in Maine. The movie begins with novelist Richard Harland and wealthy socialite Ellen Berent meeting in a train car on their way to New Mexico. Ellen happens to be reading one of Richard’s books. She can’t stop staring at him and says he looks a lot like her recently departed father. 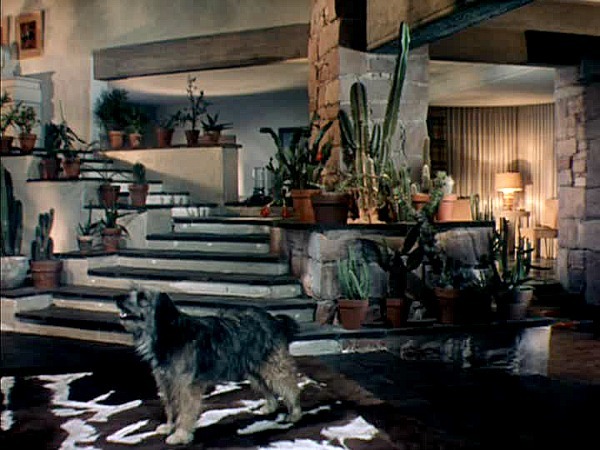 This sprawling Southwestern ranch in Taos is the first in a series of amazing houses in the movie. 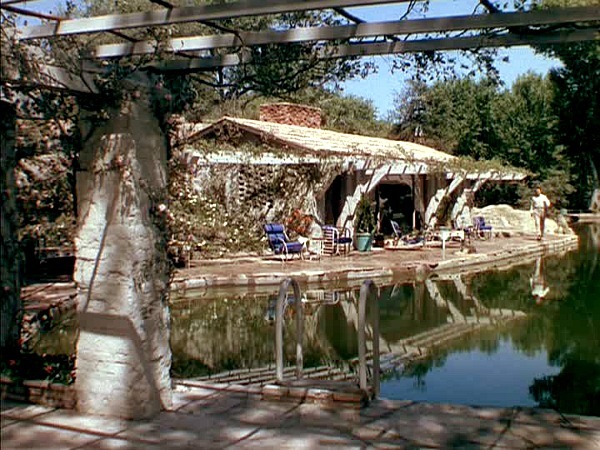 The ranch exteriors were a combination of matte paintings and false fronts. 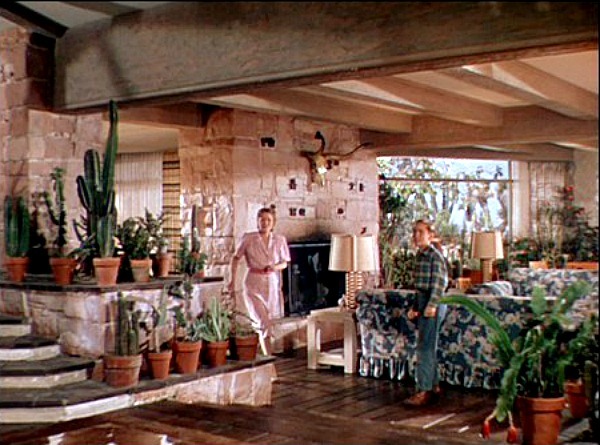 The interiors were built on a soundstage at 20th Century Fox studio in Los Angeles. Glen Robie (played by Ray Collins, above) is Richard’s attorney and the story’s narrator. The movie was based on a bestselling novel by Ben Ames Williams. In case you haven’t seen the movie, this is a good chance for me to warn you there may be spoilers in this post! 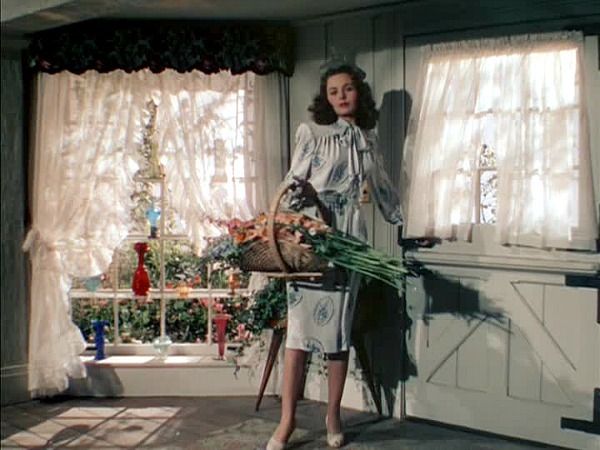 Jeanne Craine played Ellen’s adopted sister Ruth. 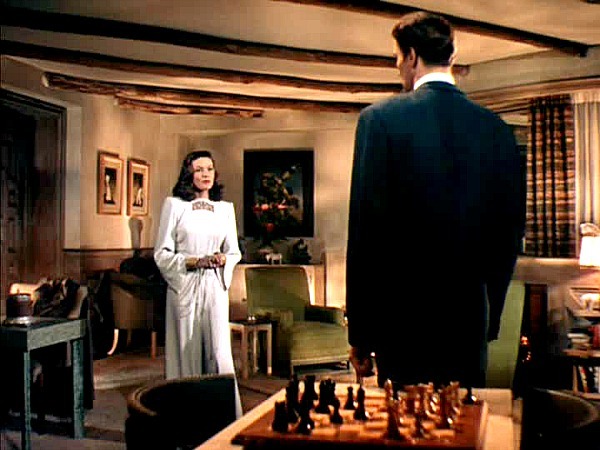 In this scene she coldly dumps her fiancé, a politician named Russell Quinton (played by a young Vincent Price). She met someone she likes better on the train, she explains, and they’re going to be married right away. Tomorrow, if possible! The newlyweds move to Warm Springs, Georgia, so that Richard can be close to his younger brother Danny, who’s getting therapy for polio, but we don’t see much more than in that shot above. 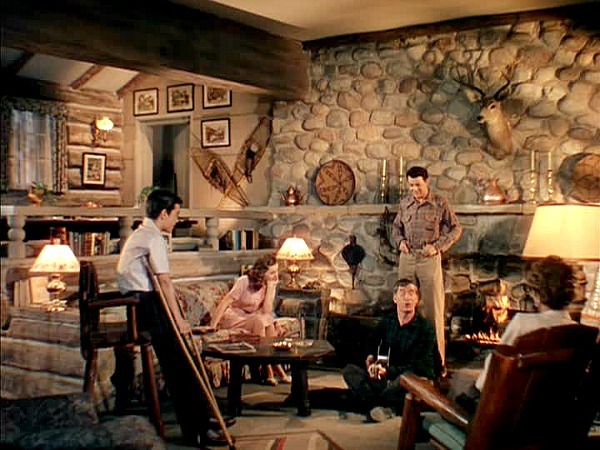 Young Danny wants to go with them to Deer Lake in Maine where Richard keeps a writing cabin. Ellen is not happy. She wants her husband all to herself. 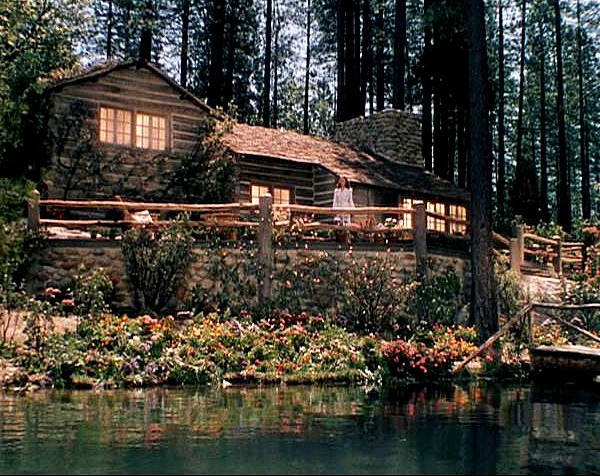 Richard says his lodge is called “Back of the Moon” because the lake is shaped like a crescent. Richard, mistaking her unhappiness for loneliness while he spends his hours writing, surprises Ellen by inviting her family to visit. But she’s furious. She barely speaks to them. 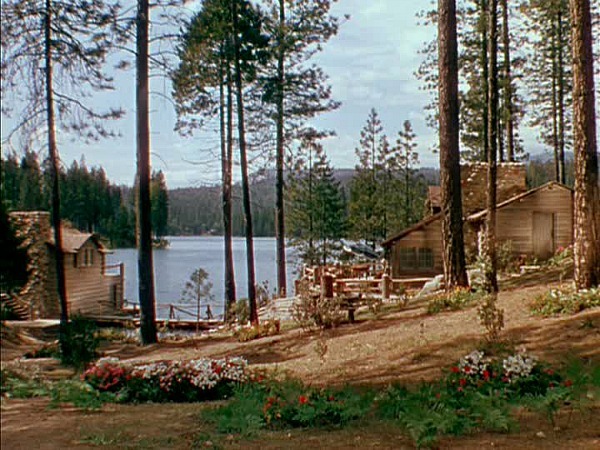 Some of the movie’s scenes were filmed at Bass Lake in California in 1945. A temporary “house facade set” was built on the shore for the movie, according to the resort. Richard and Ellen then move into her family home at Bar Harbor, on the coast of Maine. 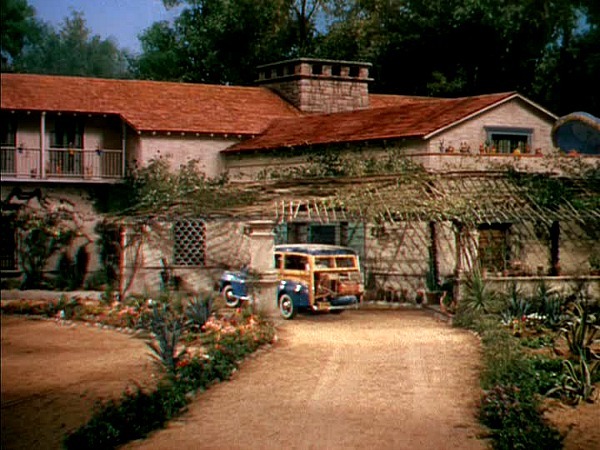 Again, the exteriors are a mix of matte paintings for distance shots and false fronts for close-ups. Ellen got pregnant to take her husband’s mind off his brother and make him happy again, but then she resents that it’s already coming between them. While the doctor orders her to continue to rest, her husband’s spending way too much time with her sister Ruth. 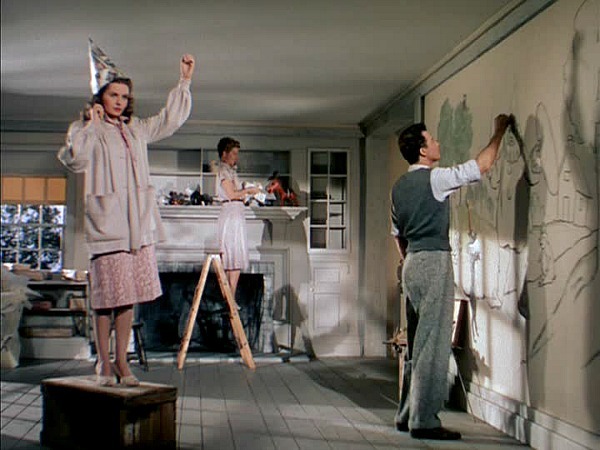 “The designs of art directors Lyle Wheeler and Maurice Ransford (not to mention the set decorations by Thomas Little and Ernest Lancing) give cinematographer Leon Shamroy wonderful material to work with.” Shamroy won an Oscar for his work on this film. 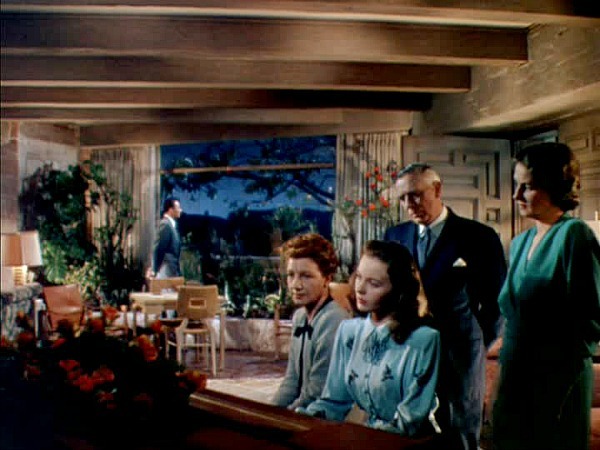 It was Fox’s highest-grossing picture of the 1940s. 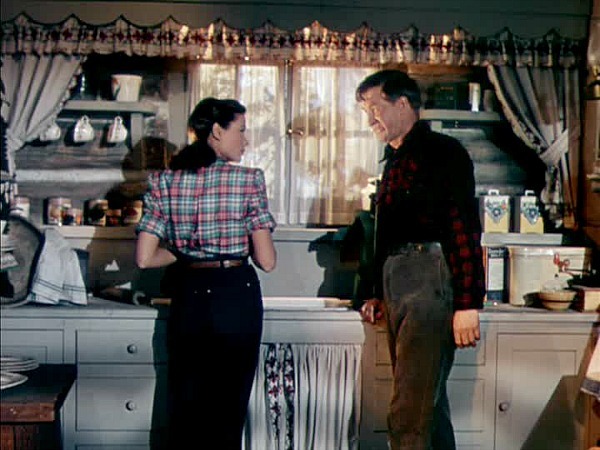 Tierney earned an Oscar nomination for her role but lost to Joan Crawford, who won for Mildred Pierce that year (I featured that movie, too — you can see the pics of those sets here). It’s amazing the number of requests I get for house plans from this movie from readers who want to replicate them. Wish I had them! 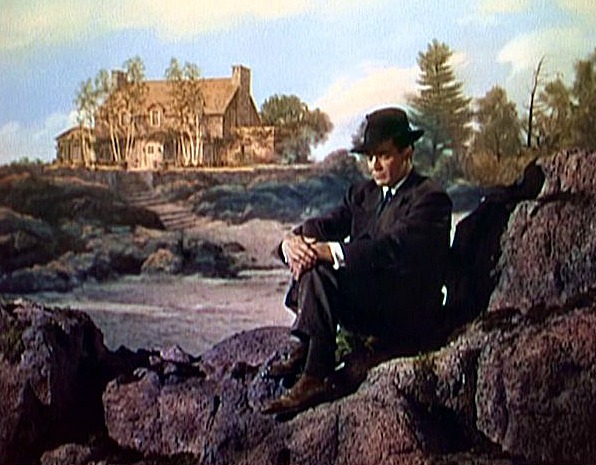 Tierney starred in another movie classic that’s a favorite of mine I’ve featured with memorable sets: Gull Cottage from The Ghost and Mrs Muir. I have seen this move alot and I have always told my Hubby if we can have a house built I would love to have one like the Bar Harbour house. I just fell in love with it when I first saw the movie as a teenager. This looks like a very spooky movie! The New Mexico home is a neat combination of funky and rustic. Those stairs, although cool, would never meet code by today’s standards, with no railing! 🙂 I adore the cabin! 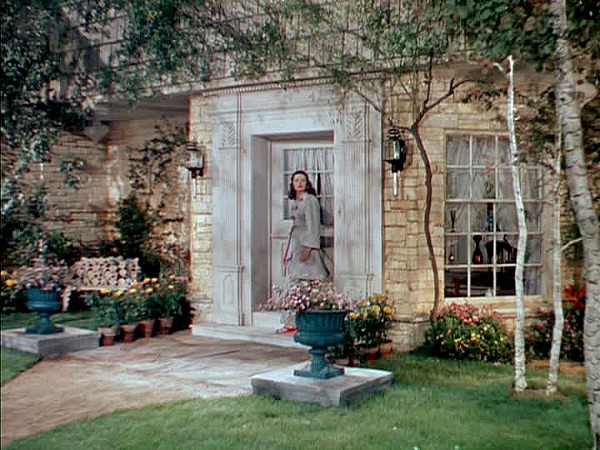 It’s incredible that anyone could be as dissatisfied as this main character, with so many gorgeous dwellings at her disposal! I know! She must not have been as hooked on houses as we are. Ha. 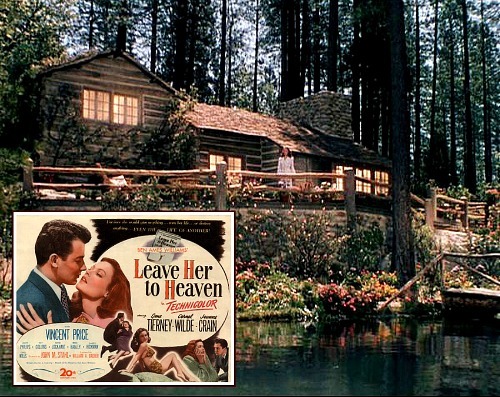 I love old movies and the “Ghost and Mrs. Muir”, and its house, is one of my absolute favorites, so I can’t believe I have not seen “Leave Her To Heaven”! Haven’t seen this one, which is kinda surprising in that my husband is a true old movies buff, and is always watching TCM. We put this first in our Netflix queue. I stopped reading your post when you said ‘spoiler alert’ so only looked at the still shots. 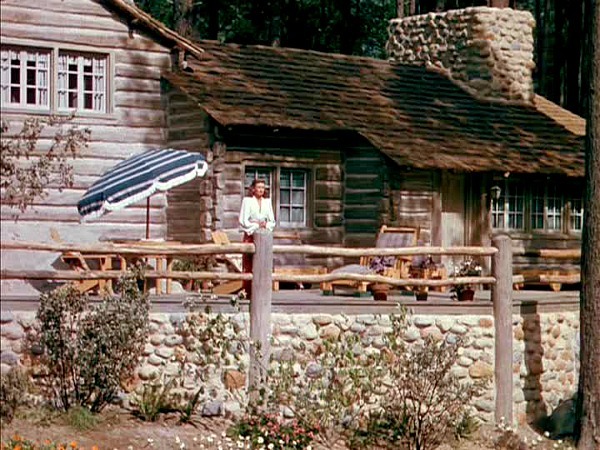 I can already tell that log cabin in Maine is going to be fun to look at (since I have a log cabin), and the Bar Harbor house looks wonderful, too. Will be studying these sets. Thanks for the tip. P.S. 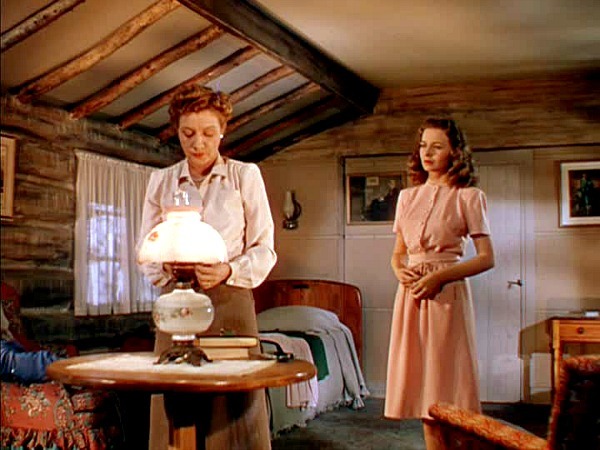 As for some old movies (and here I mean really old) with a memorable house set, one that comes to mind is “The Enchanted Cottage”. Have you seen it? Like a lot of old movies, it’s pretty cheesy, but I still like it. 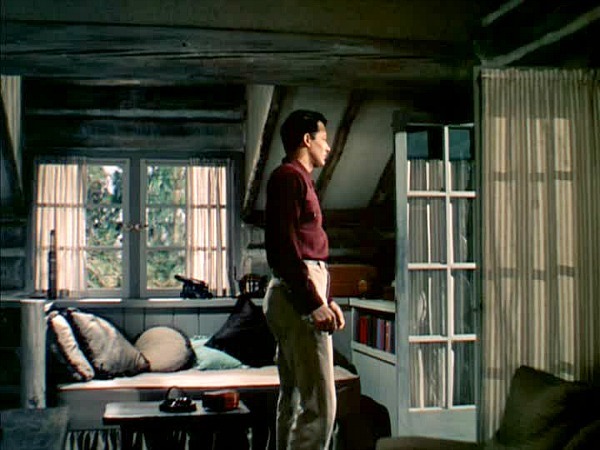 I’m sure it’s not a real house because the backdrops are obviously painted, so undoubtedly it’s built on a sound stage, but it looks old and romantic. It’s supposed to be an old stone cottage in New England on the coast somewhere. “Random Harvest” is another oldie that has a little English cottage with a picket fence and rose arbor, as well as a grand house. 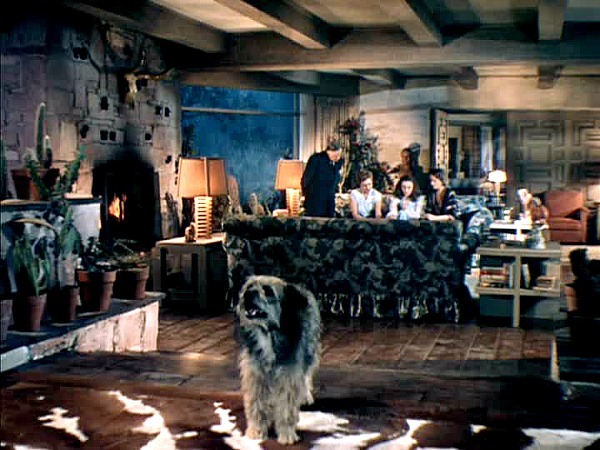 “I Know Where I’m Going” has a wonderful Scottish manor complete with a wolfhound that lounges on the sofa. Can’t remember a lot of details for these, and it may be that I just liked the atmosphere. As for ones made in my lifetime, “Howards End” is my all-time favorite house. English cottages slay me. I’m sure there are a lot more English movies from the 40’s that I can’t think of at the moment. 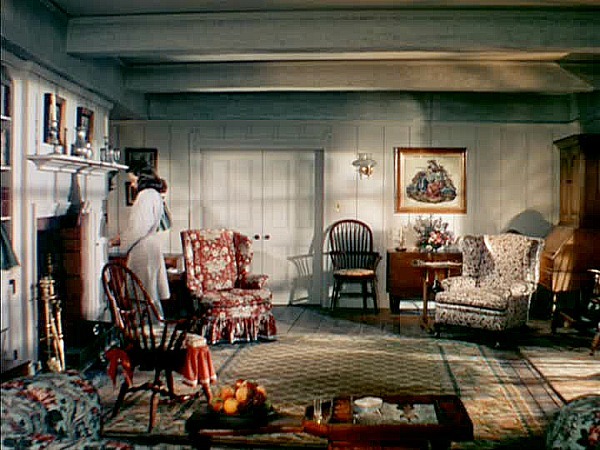 I do love the house in “The Ghost and Mrs. Muir”. 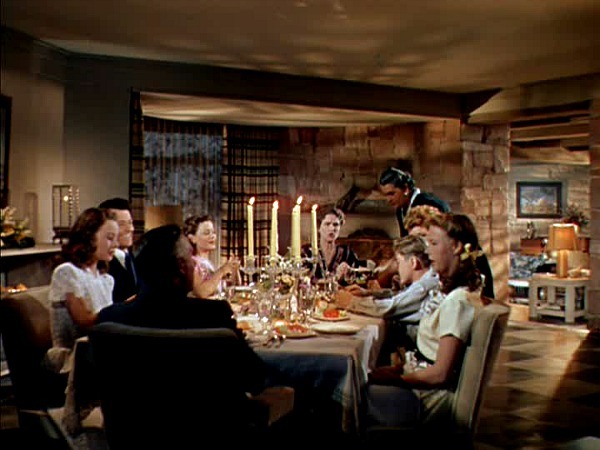 I think there is a lot of similarity to the house interior of the New Mexico house and the original Parent Trap. I love this movie! I hadn’t thought of that but you’re right, Nicole, it does! I love the Parent Trap one, too. I thought the same thing, so I went to your post about it. Not quite as similar as I thought, so I didn’t add that to my comment, but there is something reminiscent. Funny that I wasn’t the only one who thought that. 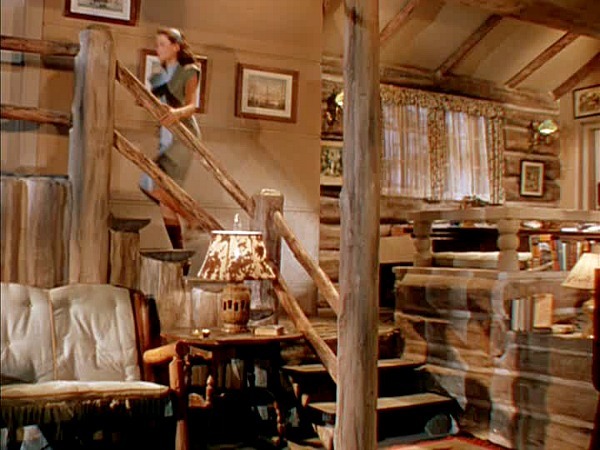 The New Mexico house has a bit of a “Parent Trap” house feel to it! That’s still one of my favorites! Congrats on the HGTV feature! I got so excited when I saw that! I get a lot of magazines, and that’s one of the only ones I read every word. Wow Julia! I had never seen or heard of this movie, but now I have to get it! The sets are just dreamy and have that old time nostalgia that is hard to resist. The plot seems disturbing though! Here I thought it was a nice love story when I started reading! Great post – as always! I have not seen this movie, but I don’t care for disturbing movies…so probably won’t look for it. 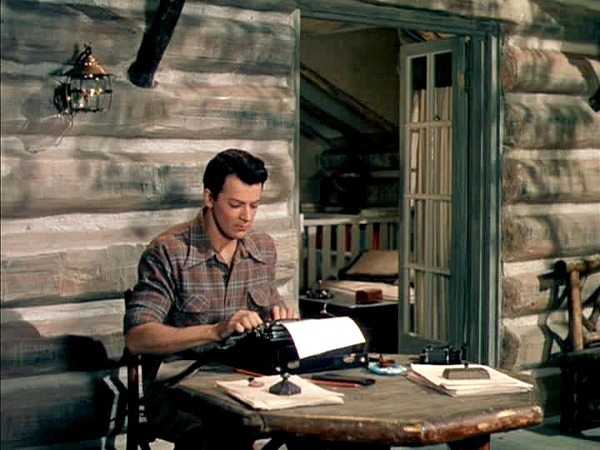 However, I adore Richard’s writing cabin on Deer Lake. Wouldn’t it be nice to have a little cabin all your own where you could write or paint or whatever crafts? Thanks for showing us these movie houses/sets…a real behind the scenes look which is great fun! I know, how wonderful would it be to have a place on the water like that to work? I’d love it! Great sets. The lodge looks like it would be a great vacation home. The movie sounds too dark and creepy for my taste, I’m more of a comedy fan when it comes to old movies. 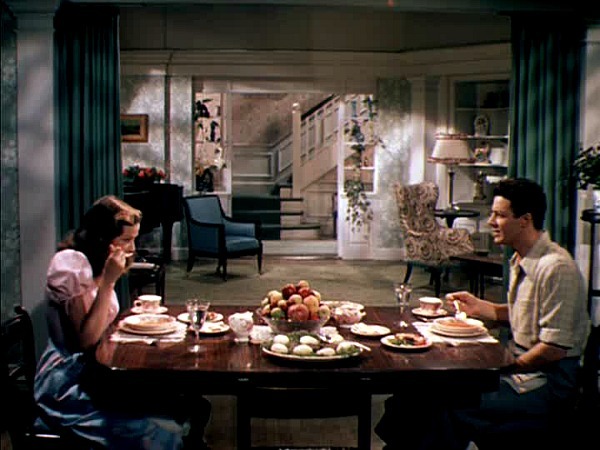 One of my favorites is “Merrily We Live”,….one of the best screwball comedies, it takes place in a huge mansion, with a great kitchen. I love a good screwball comedy but that one doesn’t ring a bell. I’ll have to look it up — thanks, Aaron! So many thoughts on this post. 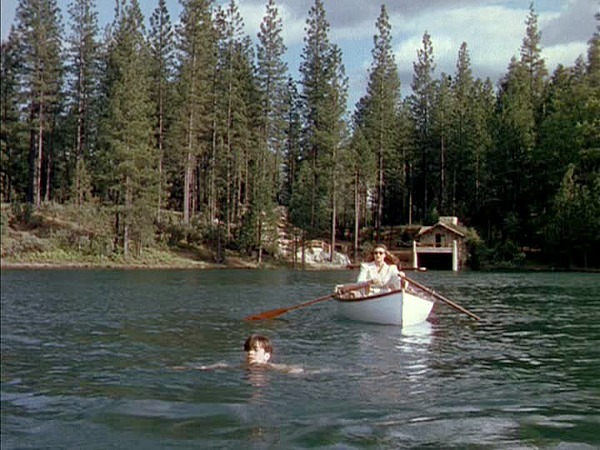 I saw this movie years ago and agree with Zanuck about the scene where she watches the brother drown…..scary. 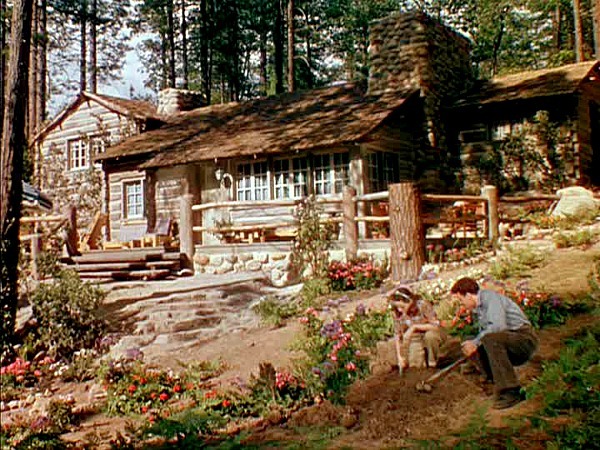 I love these 1940’s movie houses. I think my love of Windsor and wing back chairs started with them. It is so interesting to me how styles come and go. I grew up in a mid-century home with low modern lines and minimal accessories, my mother did like chintz and frilly curtains. 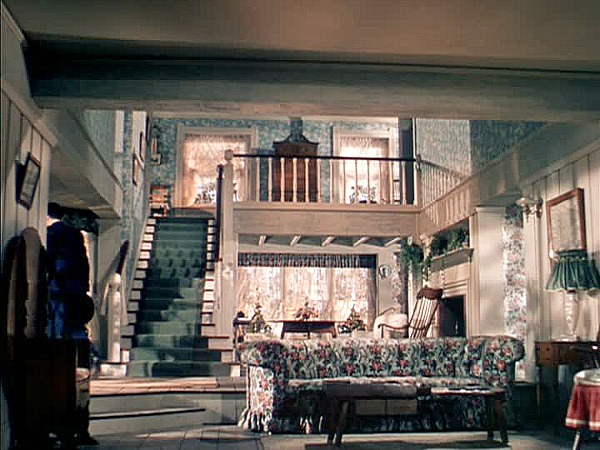 When we built our house in the mid 70’s I wanted my home to look like a 1940 type home ( although I do agree with my mom about the frilly curtains). Ten years ago my daughter was thrilled to inherited her grandmother’s Danish teak furniture and accessories. Maybe my granddaughters will love my cherry pedestal dinning room table and Windsor chairs. Love these movie house posts!!!!!! Thanks, Martha! It so true about the decorating cycles that we seem to go through. My grandmother couldn’t stand antiques that reminded her of what she had as a kid and didn’t understand why I’d want to buy them. “That old stuff? ?” Ha. I can relate! Grew up in a mid-century ranch with Danish modern furniture. I live in a 20’s cottage with Windsor chairs and my grandmother’s wing back chair, corner cupboard, antique chests, and mahogany inlaid card table. 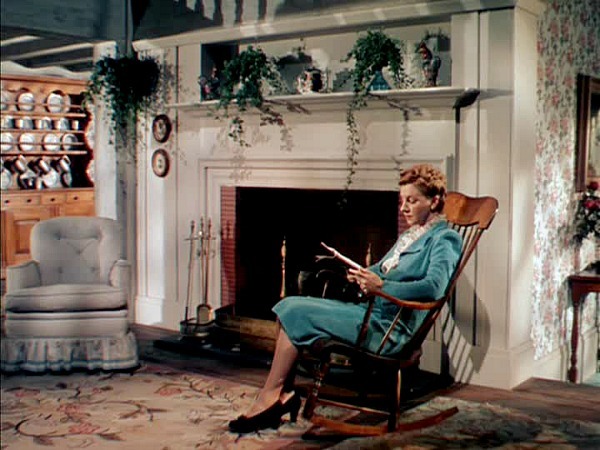 In fact, my wing chair is upholstered in a print that looks very much like that rose floral with a blue background on the sofa in the log lodge. After my parents died, I didn’t want any of the mid-century modern stuff, but my kids took some of it. I think they think my style is ‘granny-ish’, though their Granny had modern. Ha! 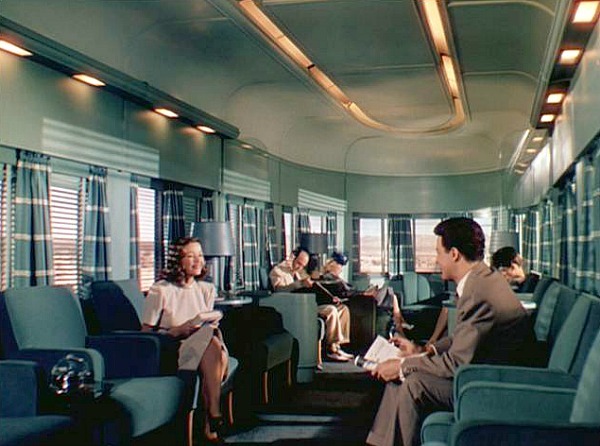 I love these 40’s interiors, without all the frilly curtains ;-). how have i never even heard of this film?? there is not an interior in these shots that i do not love! i don’t know what is more briliant–the set designs, the costuming or the way that the interiors compliment teirney’s outfits. 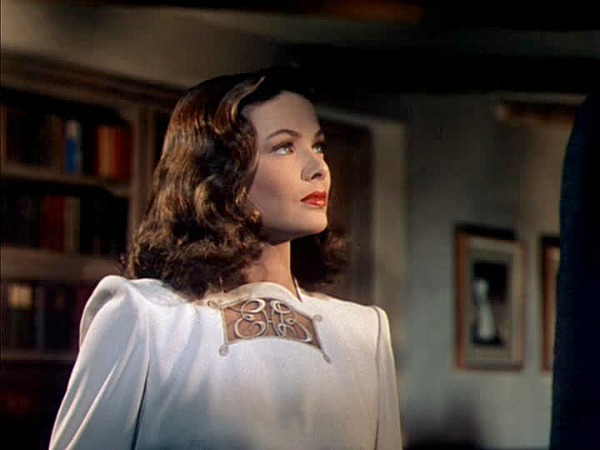 it’s all gorgeous (as is gene tierney). i love discovering old flicks that i have not seen–thanks, julia! so looking forward to the nightmares i’m probably going to have after i watch this :), as well as to getting some great, classic design ideas. I love this movie! Thank you for featuring it, I believe it was on AMC a couple weeks ago. Love your blog!!! They don’t make movies like this one any more. 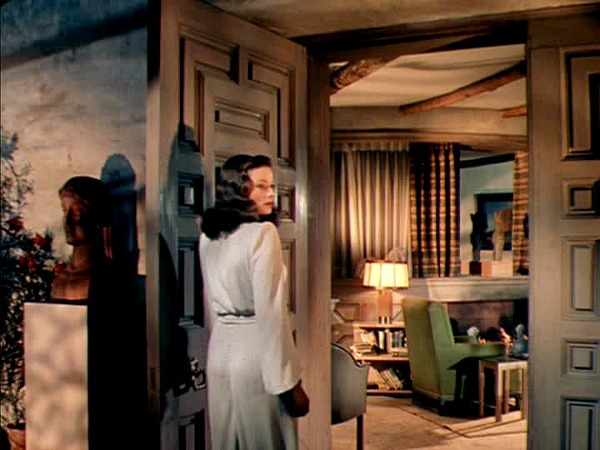 There’s such a contrast between Gene Tierney’s evil character and the homeliness of the rooms. It’s so hard to imagine that anything unpleasant could ever go on within the walls of these lovely houses. 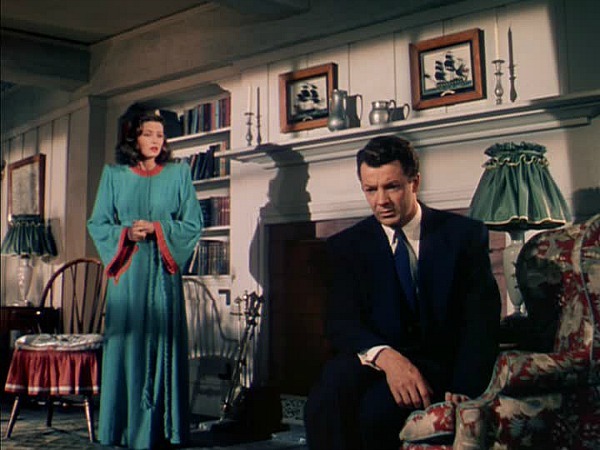 My favourite movie from that era (at least I think it was made around that time) is Random Harvest with Greer Garson. 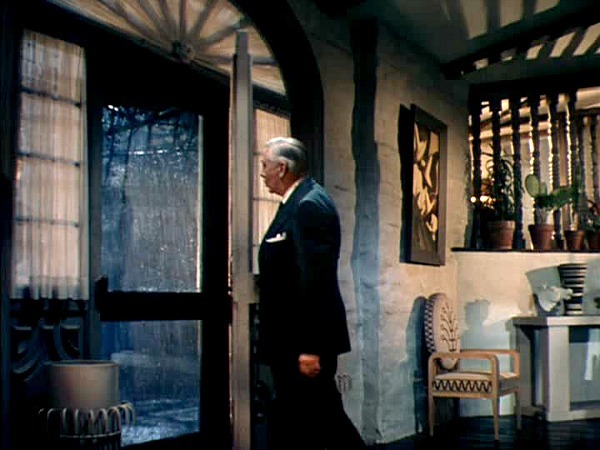 There’s a gorgeous little cottage that Greer Garson lives in with her with her new husband and the beautiful mansion that was his home before he lost his memory. Any chance you could feature these, Julia? You’re so right about the contrast between the two, Angela. 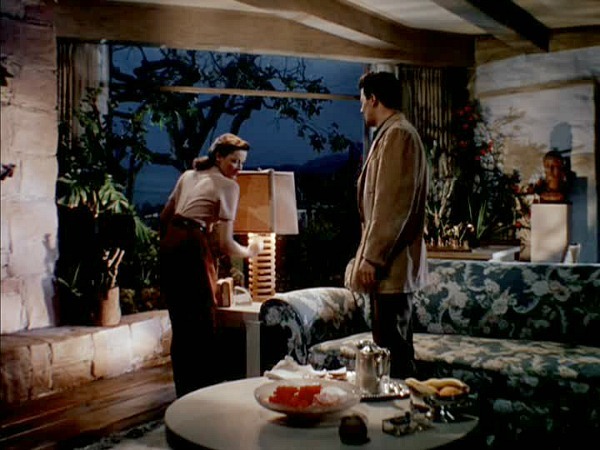 The prettiness of the sets lures us into a false sense of security in a way. It makes the things that happen more shocking somehow. I’m not sure if I’ve seen “Random Harvest.” It sounds familiar, but I’ll have to look it up. Thanks! I’ve seen this movie many times…..it really is a classic. One correction though…. It wasn’t her stepmother but her mother and a Ruth was her adopted sister. 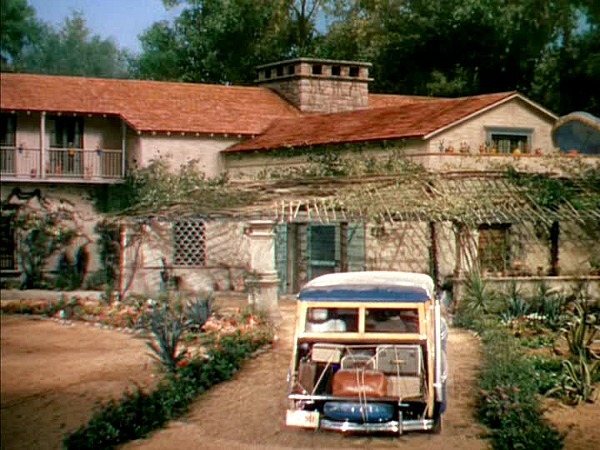 Thank you for always finding and sharing movie homes and sets. I knew Ruth was adopted but I thought her mother died when she was young and this was her father’s second wife. I can’t remember now where I got that idea now, though, so maybe I misunderstood. Thanks, Lisa! Thank you! I don’t think I’ve seen this one, and I grew up watching old movies. It’s not old old, but the mini-series “Lace” was one of my inspirations for restoring historic structures. That one doesn’t ring a bell. I’ll have to check Netflix for it! 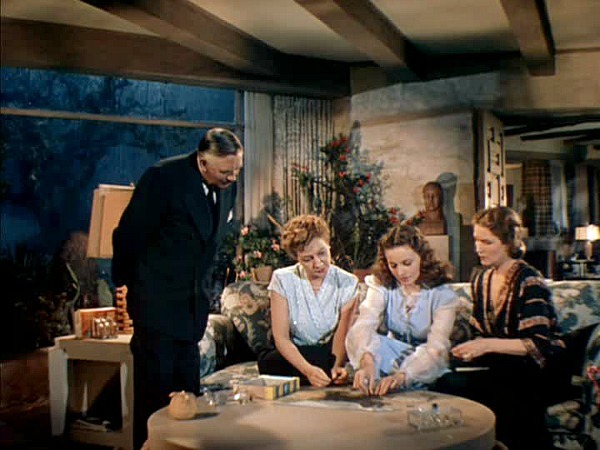 I have never seen this, but I’ve discovered a number of classic old movies through your blog: Mrs. Miniver, Holiday Inn, Mr. Blandings Builds His Dream House (LOVE that one!) and now this one. Adding it to my netflix queue. Great post, Julia! It’s amazing. Except for some dated fabrics, these homes possess many details that we desire today. Stone walls, exposed beams, beefy moldings, etc. Even the front doors and entryways could be modern day. I guess that’s what makes a classic! Thanks for sharing..
OOOOO I NEED TO SEE THIS FILM!! The sets look incredible as do the costumes. I love classic movies. Just saw this one again, followed by Laura. A Gene Teirney double feature—what a treat! Love the houses in this one. Ohhh, I was just about to send an E-mail to you about “Laura’s” apartment. It was so beautiful! I loved everything about it…elegant, yet with a cozy feel. 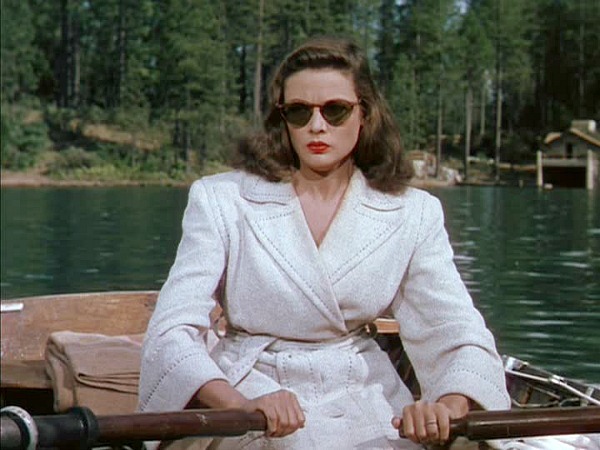 Gene Tierney was a favorite of mine. Loved her movies! 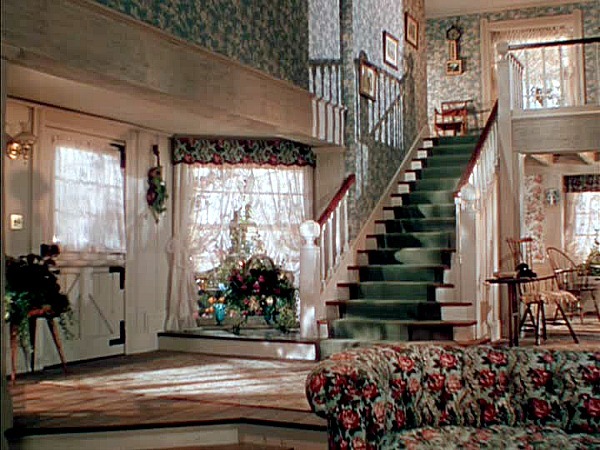 Another great house was the house from “Christmas in Connecticut”. Just lovely! Loved those sets from the 40’s! Just thought of one more, lol! 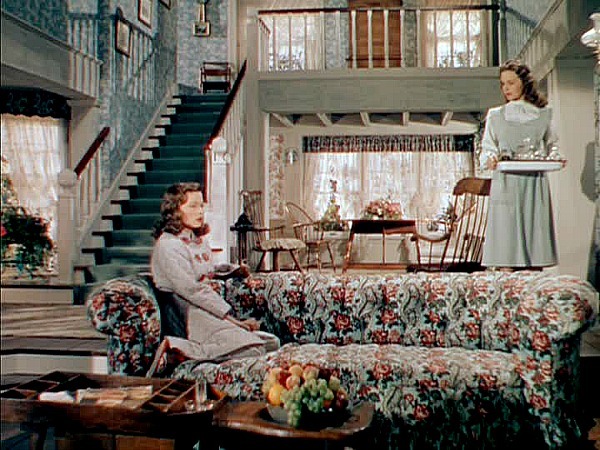 Spring Byington’s house in “When Ladies Meet”, with Greer Garson (another fave) & Joan Crawford. Gorgeous, complete with a water wheel! Really have enjoyed your website! I don’t remember “When Ladies Meet.” I’ll have to look for that one. “Christmas in Connecticut” remains one of my all-time favorites, too. Thanks, Mary! 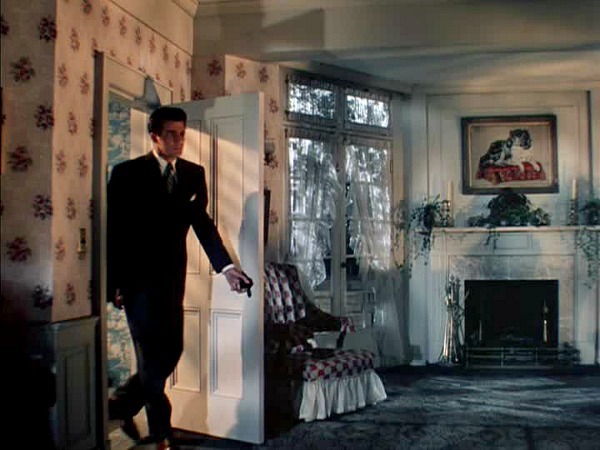 You must add “Suspicion” to your list of movie houses. 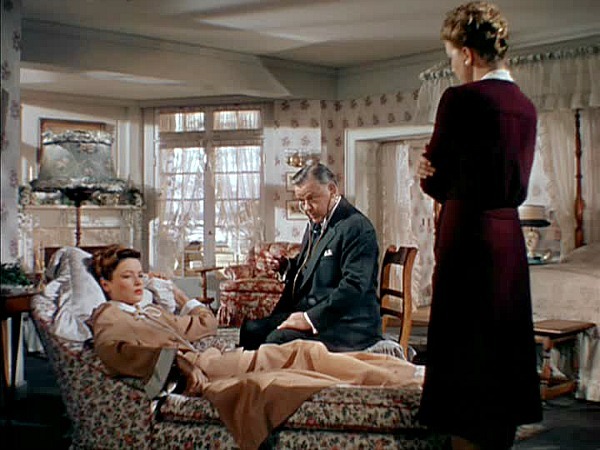 This is a 1941 film directed by Alfred Hitchcock with Cary Grant and Joan Fontaine. I think about this house all the time! 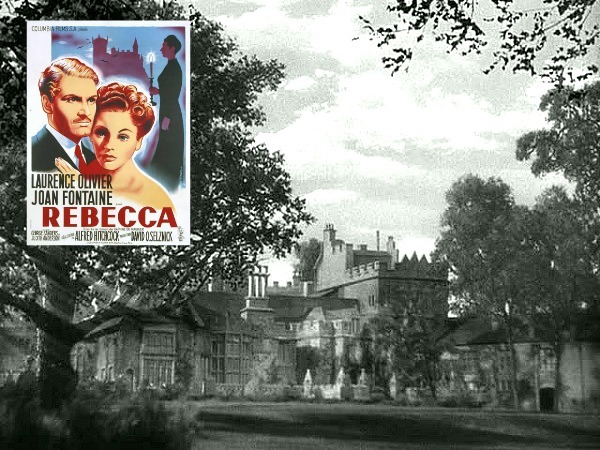 It was shot in Black and white and is set in coastal England. Check it out! That’s one I haven’t seen in years, but I love Cary Grant. I’ll have to watch it again — thanks! I didn’t think I had seen this before I clicked and saw the house. I caught it partway through one day but never knew what it was. I didn’t notice all the detail of that first house before (I was probably stuck on the style of the house which is not a fave of mine), but I’m a sucker for a sunken room. I noticed that unique coffee table in the living room of the Bar Harbor house. It has all these chubby holes and the space at the end to perfectly fit the flower arrangement, so much interesting than the usual rectangle. I never noticed it when I watched the movie before. 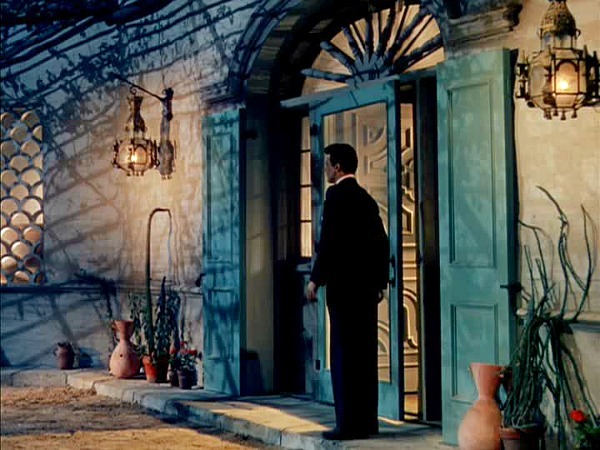 Along with the beautiful interiors, this movie also has some of the most beautiful landscapes ever filmed! I have always liked this movie since I first saw it as a teenager. 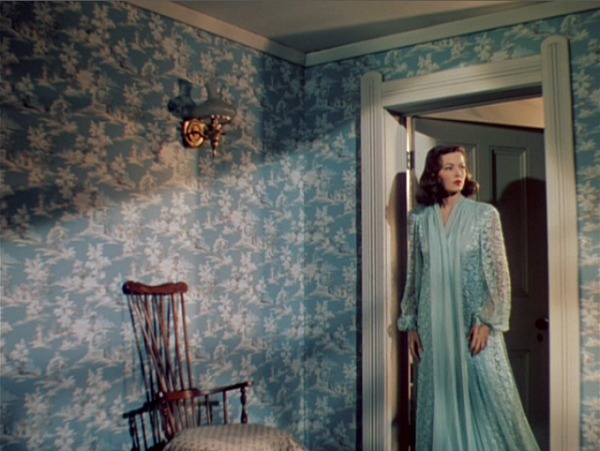 It was my dream to have the frilled white curtains in the Bar Harbour house. In the early 70s I fulfilled that dream and even though today they are daggy and old fashioned I still have a soft sport for them. Such a romantic look….. 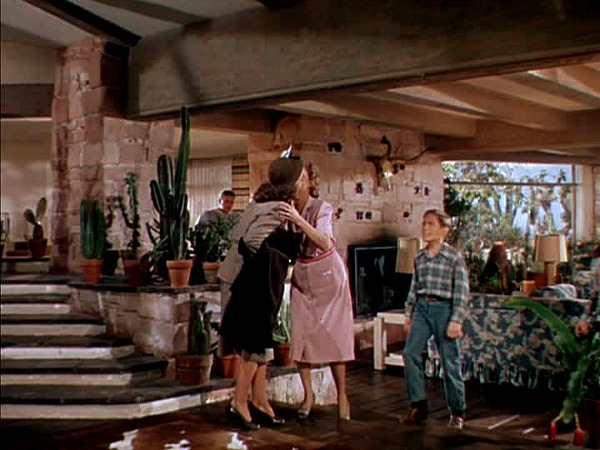 Being a fan of classic movies from the 1940’s and 1950’s, I not only enjoy the fashions and lifestyles of the day, but the various locations used throughout the filming. 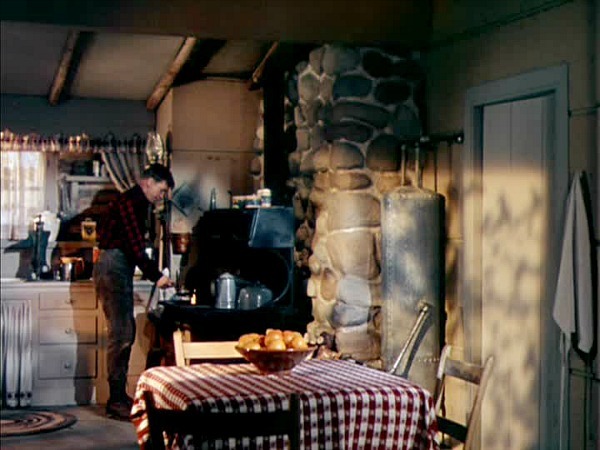 There are so many beautiful scenes in the Movie “Leave Her to Heaven” that it is hard to identify (exactly) all the locations used. There are California locations at Bass Lake and even some information suggesting Monterey, Busch Gardens, Flagstaff and Granite Dells (Arizona), plus a few scenes at Warm Springs (Georgia). Can anyone list the exact locations throughout the movie? Thank you very much! 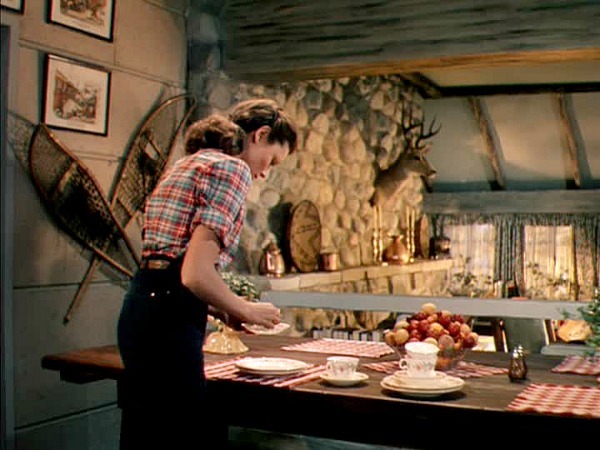 I absolutely love the sets in this movie, especially the Bar Harbour house which has that wonderful 1940s New England style. That is cool. I always wanted you to use this movie, but I didn’t know you had till just now. I too would love the Bar Harbor house. 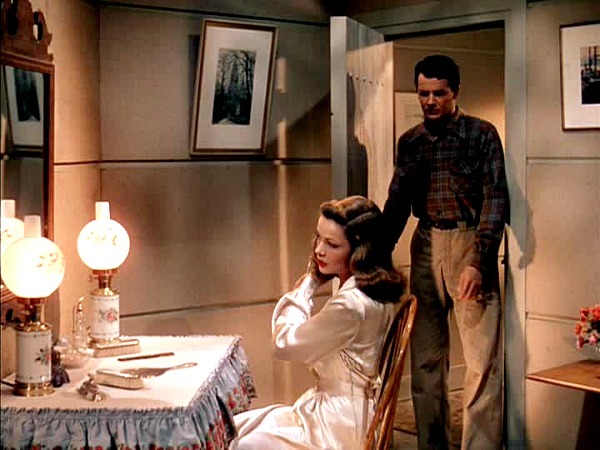 Love the old priscilla curtains still and the floors and ceilings and all the nooks and crannies, not just another big square room. Nita – you’ve just hit the nail on the head! The majority of homes built in the last 20-30 years are simply square boxes with none of the nooks and crannies that you’ve described. I know that’s what draws me to an older home. I’m happy to give up some of the, so called, modern conveniences in order to live in a much more interesting home.